ST. GEORGE — Here are the final scores for tonight’s Region 9 games. The Dixie Flyers continued their hot start to region play, knocking off rival Pine View at home on Friday night, 20-14. After the Panthers took an early 7-0 lead, the Flyers countered with a score of their own, knotting the score at 7-7 with three minutes left in the first quarter via a 10-yard run from Tyson Miller. 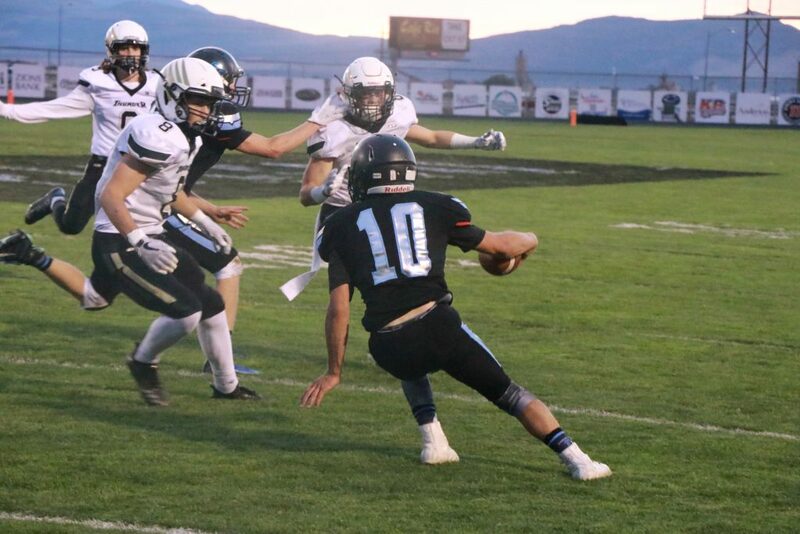 After Pine View missed a field goal in the closing minutes of the first half, both teams went to the locker room with the score tied at the half. Dixie got on the board first in the second half when Reggie Graff threw a 15-yard touchdown pass to Josh Cazier at the 7:38 mark of the third, giving the Flyers a 13-7 lead following a missed PAT. 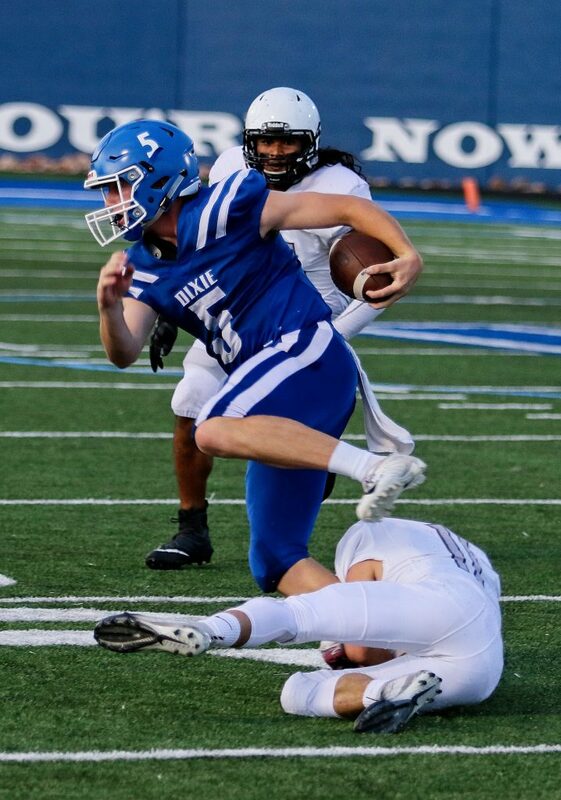 After a slew of punts and missed opportunities for both sides, Graff and Cazier struck again, connecting on a 35-yard touchdown pass to give Dixie a 20-7 lead with 3:22 left in the third quarter. After a Panthers rushing touchdown cut the lead to 20-14 with three minutes to go, the Flyer defense clamped down in the final minutes, stopping Pine View on a fourth down conversion attempt with 1:31 left in the game and holding on for the victory. The key story of the game was the Flyers’ defense, which held the Panthers to a season low 14 points. Coming into the game, Pine View was averaging 48.6 points per game. With the win, Dixie improves to 5-1 overall, 3-0 in Region 9 play. With the loss, Pine View drops to 4-2 overall, 2-1 in Region 9 play, dropping to third place with three games remaining. Pine View’s next game is on Thursday at 7 p.m. against Hurricane. The Flyers will travel to Canyon View on Thursday. Kickoff is slated for 7 p.m.
At Canyon View, the Desert Hills Thunder ended the Falcons’ two-game winning streak with a 42-14 victory on the road. The Thunder struck early, getting two quick TDs from Kina Taufa in the opening minutes to take a 14-0 lead with just under nine minutes remaining in the first quarter. Canyon View responded with a scoring drive of its own, culminating in a six-yard TD run by quarterback Colten Shumway that narrowed the deficit to 14-7 midway through the first quarter. 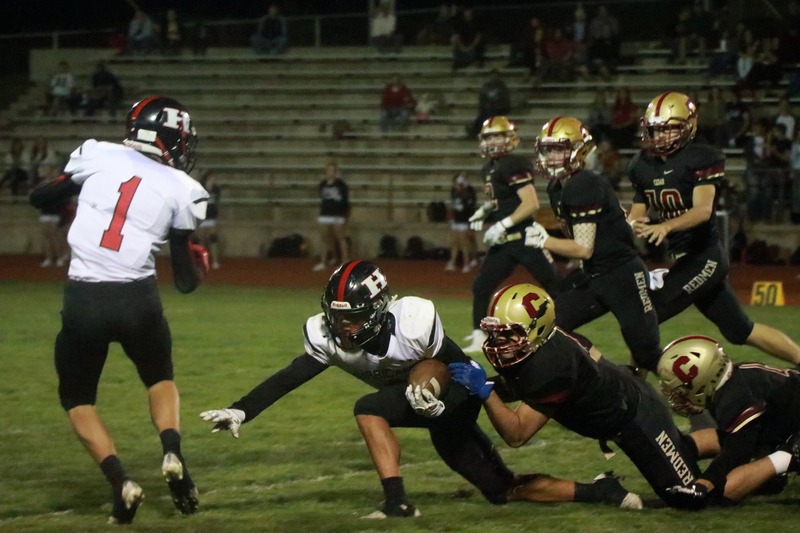 The Falcons later fumbled the ball away to Desert Hills but managed to get it back again with an interception right at the end of the quarter. During the second and third quarters, the Thunder racked up four more TDs, a 60-yard pass and an 11-yard run by Hunter Bentley and two more rushing scores by Taufa to take a commanding 42-7 lead heading into the fourth. Canyon View got one last TD in the final quarter, as Shumway threw a 13-yard TD pass to Brady Lowry to account for the final margin. In dropping their homecoming game, the Falcons fell to 2-2 in region play, including an 0-2 record at home and 2-0 on the road. Next week, Canyon View hosts Dixie on Thursday at 7 p.m., while Desert Hills has a bye. At Cedar High, the Redmen tamed the Hurricane Tigers with a convincing 53-0 win. The two teams had come into the game looking for their first region win, and Cedar’s offense responded by exploding for 53 points, just one point shy of the cumulative total the Redmen had scored in their three previous losses. The Redmen went up 21-0 in the first quarter thanks to rushing TDs by Drake Fakahua, quarterback Jaxon Garrett and Tayvien Brown. Brown added another rushing TD early in the second quarter. A short time later, Kolby Meek hauled in a 26-yard TD pass from Garrett in the end zone to give the Redmen a 35-0 lead by halftime. With the mercy rule keeping the clock running in the second half, the Redmen’s offense slowed somewhat, but Cedar managed to tack on three more TDs and keep Hurricane off the scoreboard the rest of the way. Garrett and Fakahua both scored on lengthy runs in the third quarter, with Garrett winding his way to the end zone from 42 yards out and Fakahua adding a 24-yard rushing TD several minutes later. Cedar’s final TD was a 34-yard run by Ryler Allred early in the fourth. Cedar, which improved to 1-3 in region play with the win, next hosts Snow Canyon Thursday at 7 p.m. The Tigers, who dropped to 0-3 in region with the loss, will travel to play at Pine View, also on Thursday at 7 p.m.